You'll receive this quest from Larha inside Galawain's Maw in Oldsong. Larha will tell you that some worshippers of Rymrgand entered Noonfrost recently, and that whatever they're doing inside has caused the entire district to turn icy. Larha will then inform you that she sent her sister Alwah to spy on the worshippers, but that she hasn't been seen since. So Larha will ask you to enter Noonfrost yourself and find out what happened to her sister. You'll find Noonfrost in Oldsong. Note: The quest Into the White Void will take you into Noonfrost as well, and completing that quest first will remove all of the pale elves, one way or the other. So it'll be easier to complete this quest if you work through that quest first. When you enter Noonfrost, you'll meet the priestess Vesgel (#1). She won't exactly welcome you to the temple, and she'll tell you that the priests of her clan are performing "sacred ceremonies." As a result, you'll learn that most of the temple is closed to visitors except for the shrine to the east (#2). You can just walk through and kill everybody. The pale elves won't put up much of a fight, so you shouldn't have any trouble reaching Alweh. Then when you get to her, you'll just need to tell her that it's safe to escape, and she'll exit on her own. You can sneak through the temple. This is trickier, but you'll only have to dodge a couple of guards on your way to Alweh. Unfortunately, there isn't any way to tell Alweh to follow you so you can spirit her out, and if you tell her to make a run for it, then all of the pale elves in the temple will turn hostile, defeating your purpose. So you'll have to tell Alweh to stay put, and then you'll have to sneak to the pale elf leader, Glasvahl (#8). When you reach Glasvahl, there are a few ways that you'll be able to convince him to release Alweh: you'll need to be Rational 2, you'll need to be a pale elf, or you'll need to be a Shieldbreaker of St. Elcga or a Kindly Wayfarer paladin. Failing that, all of the pale elves in the temple will turn hostile, and you'll have to fight them. But assuming you're successful, you'll then just need to return to Alweh and tell her that she's free to go. She'll exit the temple on her own. Regardless of your choice, when you return to Larha, she'll reward you with Scales of the Raven, and you'll also earn an "extraordinary" reputation bonus with the Fangs and a "minor" reputation bonus with Twin Elms. Afterwards, if you talk to Alweh, then she'll teach you the Blooded Hunter talent (+1 DR for Slash and Pierce, +1 Stealth). You'll find a Blue Crystal Key in the wooden box on the altar here. You'll find a Silver Key on the desk here. To open the door to the prison, you'll need the Silver Key (#3) or Mechanics 2. To open this door, you'll need the Blue Crystal Key (#2) or Mechanics 9. To open the door to the storage room, you'll need Mechanics 3. Inside, you'll find a White Crystal Key in a locked chest. To open the door to this room, you'll need the White Crystal Key (#6) or Mechanics 5. Inside the room you'll find Wend-Walker on a trapped table. 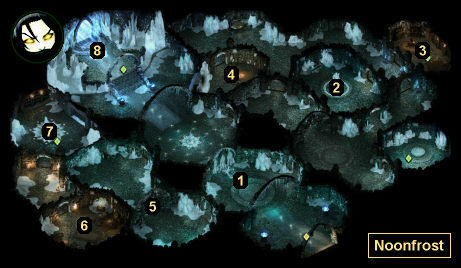 You'll also be able to detect a loose tile that will open up the secret door leading to the frost-hewn breach (#8).